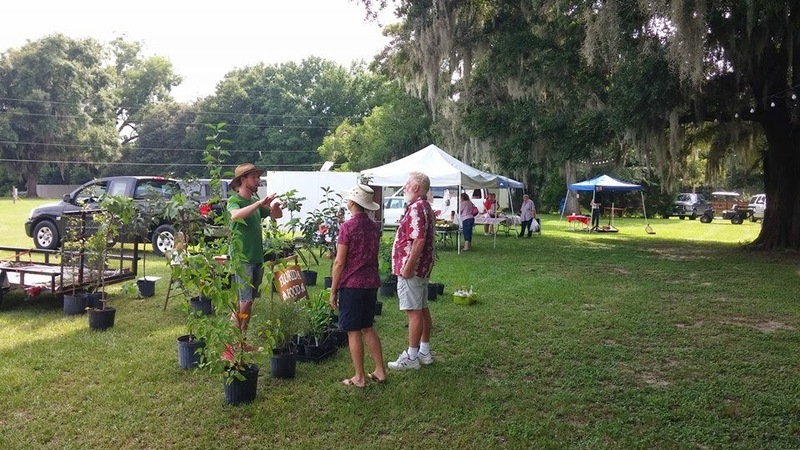 Florida Survival Gardening: This Week at the 326 Community Market! Suriname Spinach! Hot Peppers For Your Fall Garden! This Week at the 326 Community Market! Suriname Spinach! Hot Peppers For Your Fall Garden! We had another wonderful week last week with lots of friends popping in to say hi. If you haven't stopped by yet... what are you waiting for? In my last newsletter I mentioned this exciting vegetable. In Latin it's known as Talinum fruticosum... on our homestead, it's known as delicious. Small pots are $2.00 each... larger pots are $6.00. I started a bunch of hot peppers for everyone's fall gardens. They're $2.00 a pot... but for some reason I'm not selling any. What's up with that? C'mon, make me a deal or something! These guys are lovely and they need to get in the ground so they can start making you some salsa! I've got about 100 in the nursery, both jalepenos and cayennes. There's no way I can plant and eat all these myself... but if they don't sell I'm going to try. Hehhehheh. Pick some up for your fall garden and learn to grind your own red pepper. The taste of homegrown peppers is unbelievable! I've got JUST two peach trees left at $20 each! I picked up some olive trees this week - come on down and get your own Arbequina olive and plan on some tasty Mediterranean dishes. Only 2 left!!! I still have some. Small goji berries are $4.00 a pot... pick up a few and discover this weirdly flavored lycopene-loaded superfruit. I have small Illinois Everbearing trees for $12.00 each. Don't worry about the size... mulberries grow FAST! I also have some dwarf ones back in stock for $8.00 a pot. Plant a mulberry hedge! Do you have a pond? A swampy spot? A kiddie pool? Chinese water chestnuts are a delicious root crop that loves the heat and will produce abundantly. It's also perennial! Give 'em a try! Simply one of the best fruit trees for this area. Sweet, luscious, non-astringent fruit... and my price of $29 per tree is really hard to beat. I've got a limited amount of potted cassava plants for sale again... grab 'em before they're gone! I've also got a few of the pretty variegated type... you'll love the way they look, though they're better for leaf production than for roots. Coming soon: herbs, moringa, katuk, edible-leaf hibiscus, Suriname spinach, white mulberries! Would love to be there! I'd take some of those plants but, especially the hot peppers to make my own hot pepper sauce. Much better than store bought. People need to know you got some real food treasures there. Thank you. It's funny: I sell plenty of interesting fruit trees, ginger and strange perennial plants... but normal hot peppers? Not many.